Mixed traditional bouquet To Include Lillies, Chrysants and other seasonal flowers. 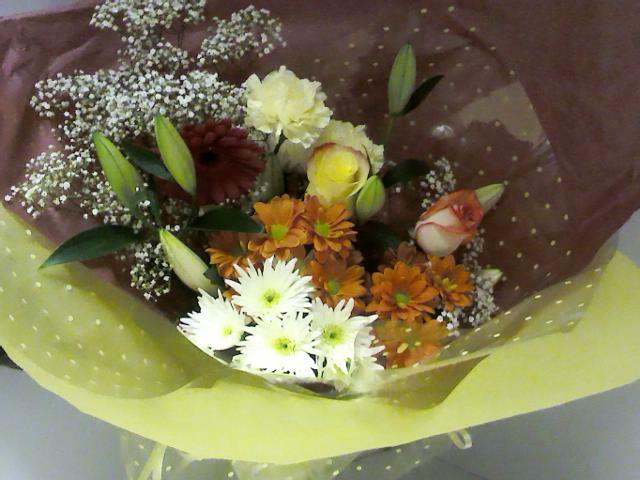 Traditional flower bouquet for mixed seasonal flowers. This is our most popular bouquet. This is a mix of seasonal cut flowers. This makes a nice gift for a birthday, get well, new baby or just to say thank you. This flower bouquet of fresh flowers can be made in different sizes and a choice of colours. A bouquet of fresh cut flowers is always a great gfit, especially when someone likes to arrnage flowers themselves. This bouquet is a mix of flowers that are in season at the time of ordering.